In this section we are talking about specific technologies: bar codes and RFID, for identification of items, locations or individuals; and hand held mobile computers, used to direct activities or collect information. In any project to introduce or update information systems using these technlogies, there are five key elements which determine success of the project. This page talks about the first item, system design. 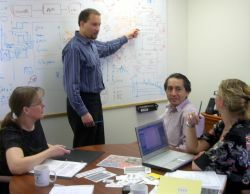 By system design we mean the definition of the way that the system will be used. What will be identified? How will it be identified? How are new items added to the system? How do we track moves? Who has rights to view and edit data? Poor decisions at this stage of the project can lead to extra work (at implementation and beyond), poor usability, and sometimes lack or failure of key functionality. Achieving an effective design, and completing a design verification process is key to project success. For most projects one of the main problems is that no single individual holds all the answers. Our clients usually have a very good understanding of their own internal processes, but sometimes that information is shared between several individuals, with no one person holding the full picture in detail. And whether the project is for the introduction of new technology, (bar codes, RFID, or hand held computers), or just for an upgrade, it is usually the case that the operational personnel have little knowledge of the capabilities (and potential pitfalls) of these technologies. SageData have been installing these systems since 1991. We have a rich and varied experience, with large organisations and small, with asset tracking and warehouse mangement, counting Caribou and more. But we don't have a detailed knowledge of our client's day to day operations. So the design must necessarily be a group activity, with different players contributing according to their specialised knowledge. At our first meetings, we review your operational procedures. We use a checklist to make sure we capture the key metrics of your operations. We explain and demonstrate the capabilities of the systems, and determine what is required in the function of the new system, and what changes will be required to ensure that our software provides the best user experience. We evaluate different hardware, and may install a "trial" system, to get feedback from our clients. 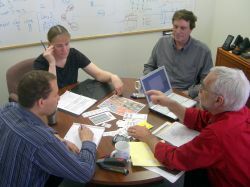 These meetings can be face to face, or can be conducted by conference call. So the sytem design is a joint effort, with our clients being the operational experts, and SageData providing technology and system expertise, and drawing on our knowledge of similar applications. When the intial review is completed, we are usually able to provide a proposal for the system, complete with functional specification, costing and schedule. Once an agreement to proceed is in place, we repeat the process, with one or more discovery meetings, at which the design is developed and reviewed in more detail. On agreement to the updated system design documents, implementation can begin. If often happens that we join a project when the initial design work has been completed, perhaps by the client's operational personnel, perhaps by the internal IT department. In this case SageData can offer a design review, examining the system design for flaws or potential weaknesses. Whichever way we go, SageData can help with the overall system design, and help steer you around the potential dangers and pitfalls inherently associated with the introduction of new technology. For further information contact Keith Jackson or Doreen Wallace, or send an e-mail to info@SageData.com.